Six months before he passed away, the man behind the legendary gun wrote a letter of repentance to the Russian Orthodox Patriarch, where he complained about his mental anguish, because his creation was used to take people’s lives. 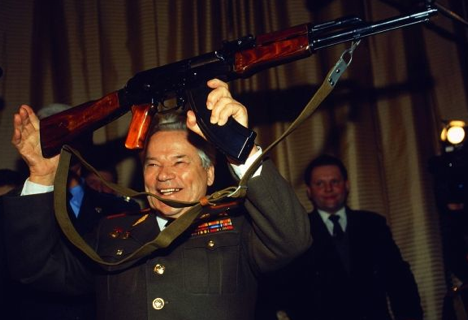 Should Mikhail Kalashnikov have felt remorse for what people did all over the world with the help of his deadly weapon? This issue had become a subject of heated debates throughout the life of the legendary designer. After Kalashnikov died, we learned that six months before his demise, he wrote a letter of repentance to the Patriarch of Moscow and All Russia Kirill. The document dated April 7 contains two typed pages and the handwritten signature of the designer. There Kalashnikov told the head of the Russian Orthodox Church (ROC) about his emotional stress and trepidations about his responsibility for the deaths of people killed by the submachine gun he had created. “My mental anguish is unbearable, I have the same insoluble question: if my submachine gun took people’s lives, does it mean that I, Mikhail Kalashnikov, ninety-three years old, the son of a peasant, and Orthodox Christian by my faith, am responsible for the deaths of people, even if they were enemies?” - Kalashnikov asked the Patriarch. “We always kept pace with the times, we were ahead of our main rival, the Americans, in some areas, and at the same time we were friends on a human level, though we served different social systems, which were irreconcilable in those years,” Kalashnikov said. In addition, he shared his thoughts about the future of the country and humanity in his letter. “Yes, the number of churches and monasteries in our land is increasing, but evil is still not decreasing!.. Good and evil live side by side, fight against each other, and worst of all, reconcile themselves to each other in the hearts of people – that is what I have come to understand at the end of my earthly life. Life turns out to be a kind of perpetual motion machine, which I wanted to invent so much when I was young. Light and shadow, good and evil – are these two opposites of a whole, which cannot exist without both of them? And was it the Almighty that arranged everything in this way? And does humanity have to lead a miserable life in such an interrelation forever?” he wrote. “And in my later years, the Lord has advised me to approach the holy sacraments of Christ, with the help of my friends, and to confess and receive Holy Communion with Body and Blood of Christ,” wrote Kalashnikov. “In You I trust in my sinful meditations, on Your pastoral word and Your sagacious wisdom. I watch and listen to Your sermons and answers to letters of the laity, whose souls are in everyday commotion. You help many with the Word of God, people need spiritual support,” noted Kalashnikov in his letter. Alexander Volkov, press secretary of Patriarch Kirill, said that the Patriarch had received Kalashnikov’s letter and even wrote a reply. Many of those who designed weapons were often disappointed with their work at the end of their lives. Robert Oppenheimer, the creator of the atomic bomb, was shocked with the destructive power of the weapons he had created after the bombing of Hiroshima and Nagasaki. He felt a sense of guilt, and since that time, he actively fought against the use and development of this new weapon. “He invented this submachine gun to defend his country, and not to be used by terrorists in Saudi Arabia,” said Volkov. The designer’s daughter Elena urged people not to treat the change of opinion of Mikhail Kalashnikov too categorically. “Of course, we cannot say that he went to services or lived strictly according to the commandments. We must understand his generation. After all, we can talk about someone having faith in God, but not being a believer. And one can be a believer and never say a word about it. Mikhail Kalashnikov never revealed what he was feeling. I remember someone once brought him a crucifix, back in 1999, and I can say that I forced him to wear it and said – ‘Mark yourself with a sign of the cross’, and he replied – “I cannot, I cannot raise my hand”, he simply laid his hand on his heart,” says Kalashnikov’s daughter.